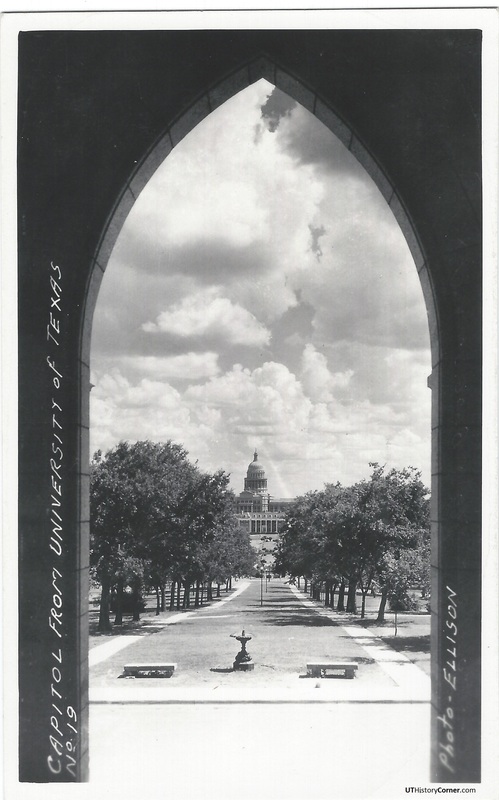 Browsing through old UT postcards is a fun way to explore some campus history. Here are a few from my collection. Click on the image for a larger view. Old Main: Victorian-Gothic in style, made from yellow buff brick, limestone trim, and with a slate-tiled roof, the old Main Building was the first structure on the campus. Dated from the early 1900s, this is one of the earliest color images of campus, likely taken by UT physics professor (and avid photographer) John Kuehne. The old Main Building was constructed in three phases, with the west wing built first in 1884. The middle tower and north wing were added in 1889, and the east wing completed the building 10 years later. 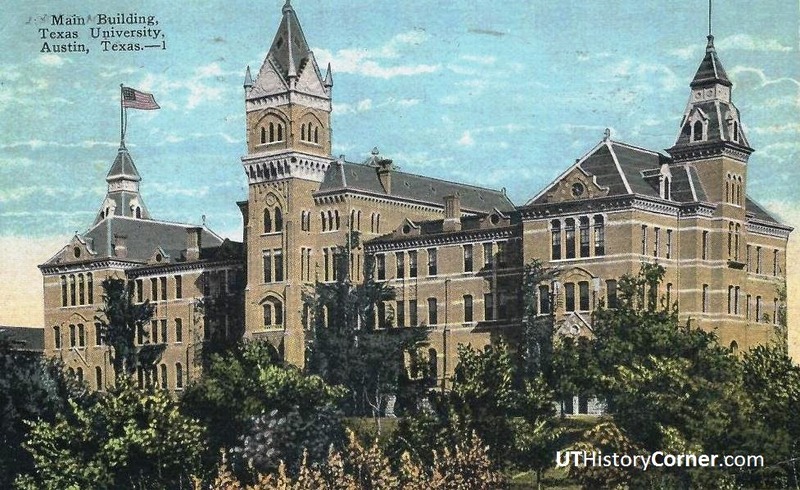 Old Main contained most of UT’s administrative and faculty offices, classrooms, the University library, and a 1,500 seat auditorium. It was replaced by the current Main Building and Tower in the 1930s. The view of of the Texas Capitol from a fourth floor window in the west wing of the old Main Building, around 1905. The tree-lined drive entered the campus from University Avenue and 21st Street (where the Littlefield Gateway is today), made its way up to the front of Old Main, then circled back around and out to the south. The view from the Gothic-styled front door of Old Main around 1920. 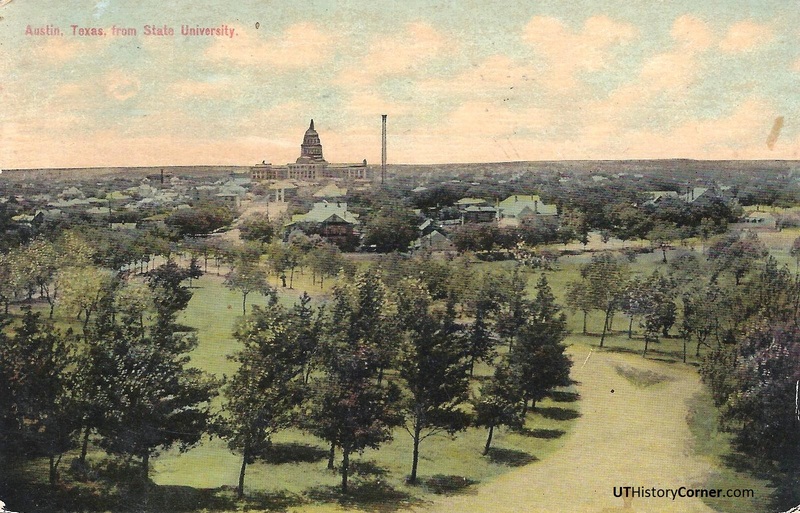 This early version of the South Mall was lined with hackberry trees. 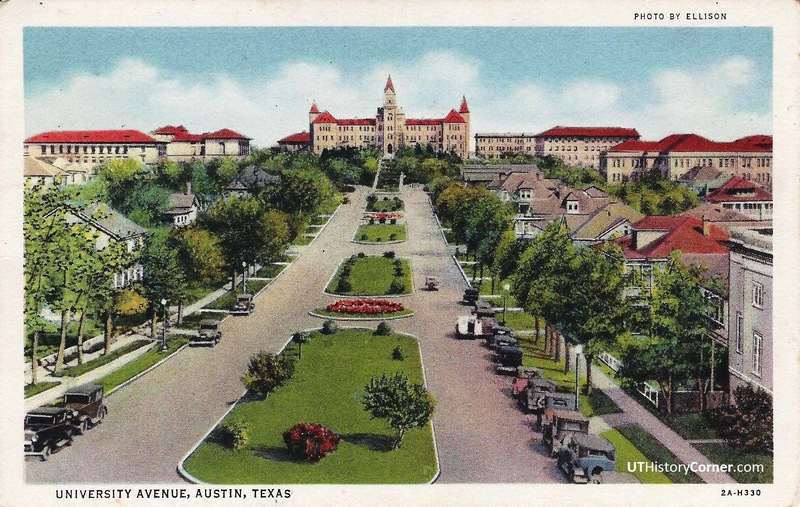 In the 1930s, the Mail Mall was installed and the South Mall shortened, widened, and lined with live oaks purchased from a nursery in (appropriately) Orange, Texas. 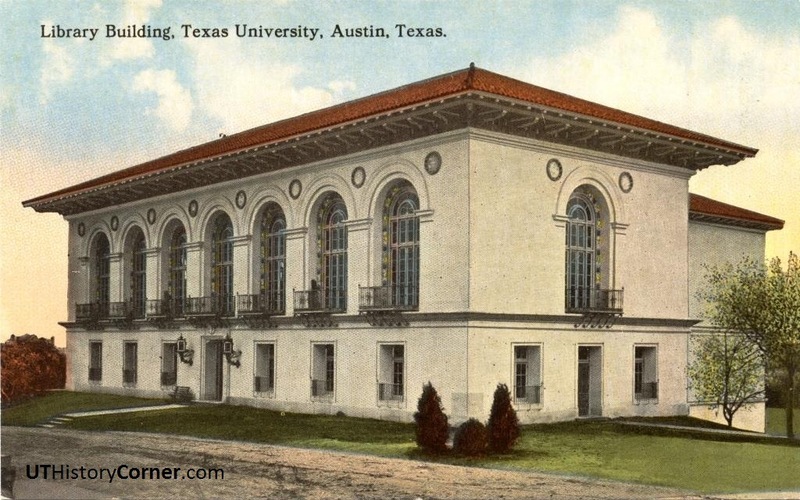 Brackenridge Hall, or “B. Hall,” was the University’s first residence hall for men. Opened in 1890, it was intended to provide inexpensive housing for the “poor boys” of the state. The Eyes of Texas, Longhorn Band, The Texan newspaper, student government, Bevo the longhorn mascot, and other UT traditions have ties to B. Hall. 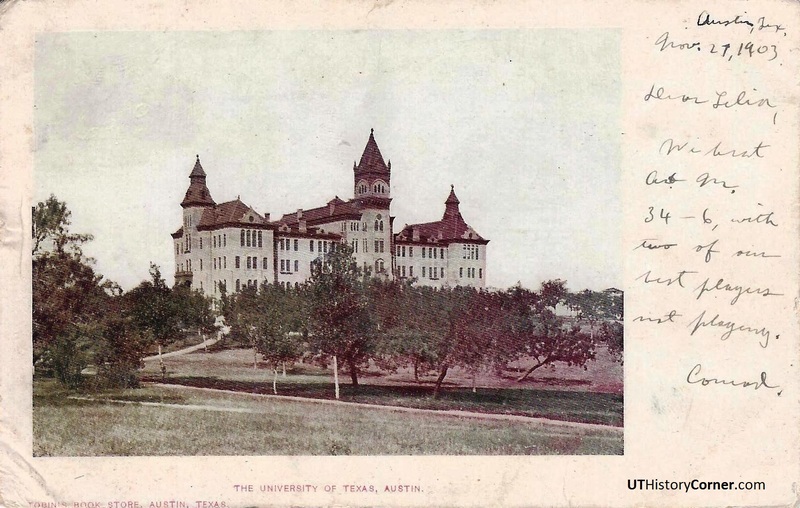 The building was closed as a dorm in 1926 and razed in 1952. 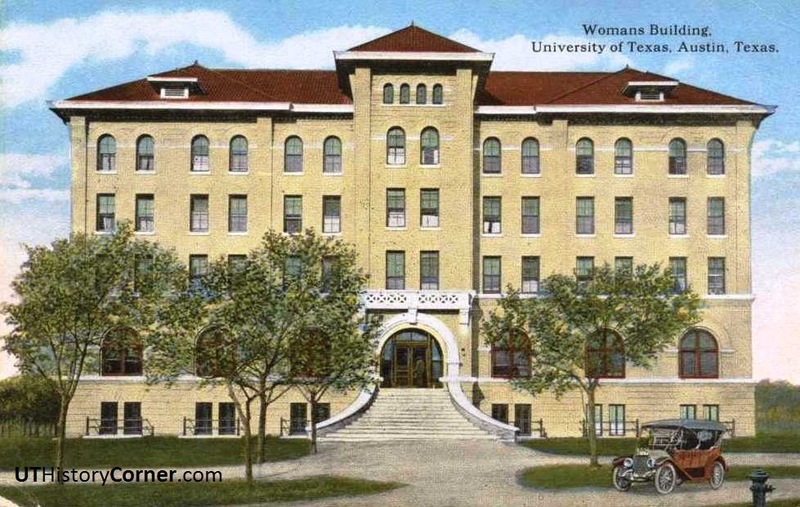 The Woman’s Building, the first residence hall for female students, was constructed in 1902 about where the Flawn Academic Center now stands. The building had a parlor, dining hall, a basement gymnasium with a running track, pool, and basketball court, and an upstairs infirmary. At the time, co-eds were only allowed to go out with friends or on a chaperoned date three times a week, and the curfew was 10 p.m. 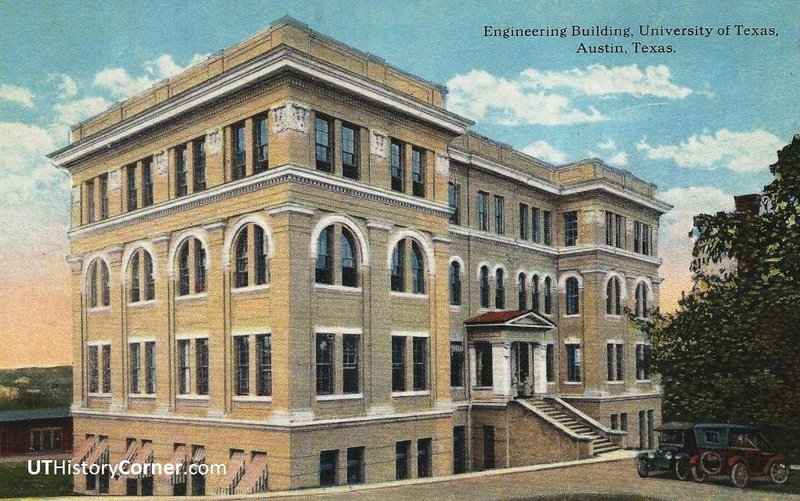 Built in 1904 as the Engineering Building, the Gebauer Building is the oldest surviving structure on the Forty Acres. 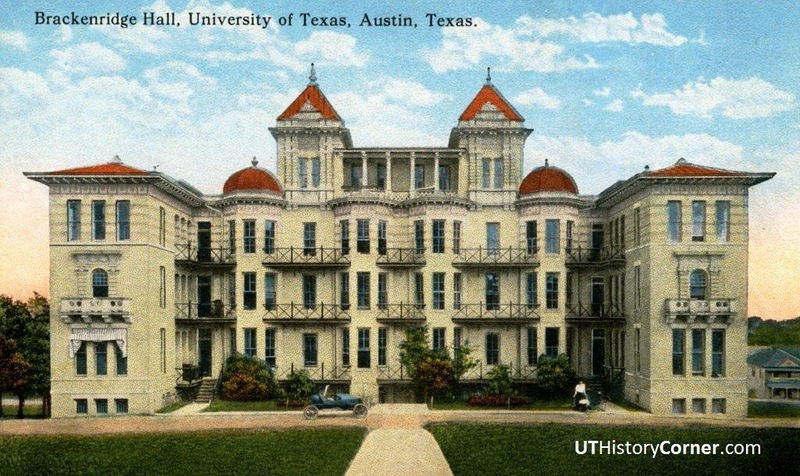 It was made from the same yellow brick and limestone trim used for the other early UT buildings, including Old Main. It’s housed engineering, journalism (Walter Cronkite attended class here in the 1930s), speech, student services, and is today home to the College of Liberal Arts. In the 1980s it was named for Dorothy Gebauer, a former Dean of Women. The old Law Building was built in 1908, and was the last of the yellow buff brick structures. 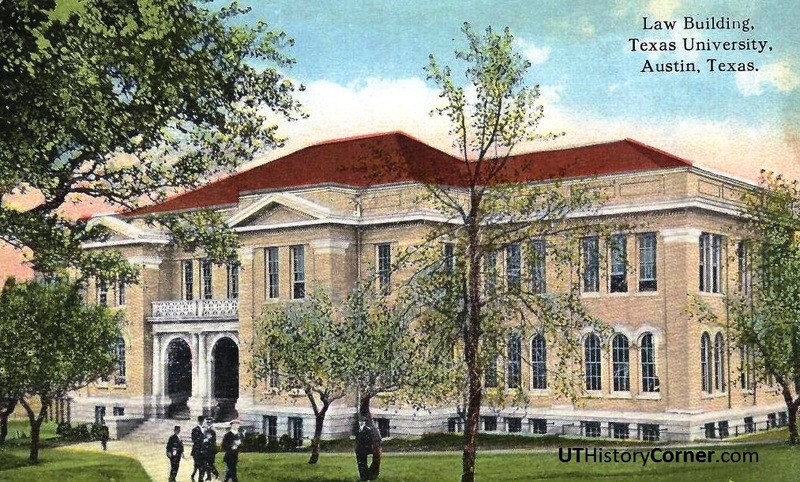 Located in the southeast corner of the original forty acre campus, the building was turned over to the anthropology department in the 1950s and renamed for James Pearce, a UT alumnus and anthropology professor. The building was destroyed in the 1970s for the Graduate School of Business building. Battle Hall was the University’s first separate library building. Designed by architect Cass Gilbert and opened in 1911, the building’s Mediterranean Renaissance style set the tone for the rest of campus. Among the eminent architects of his time, Gilbert was also responsible for the Woolworth Tower in New York City (for a time the world’s tallest building), and the U.S. Supreme Court Building in Washington, D.C.
A ground-level view of Battle Hall. Architect Cass Gilbert’s design was inspired by the Boston Public Library. Built before the invention of air conditioning, the building faced east so that the broad, arched windows could be opened to circulate the cooling gulf breezes from the southeast. Today, Battle Hall houses the Architecture and Planning Libraries. A view of the southwest portion of the campus around 1920. 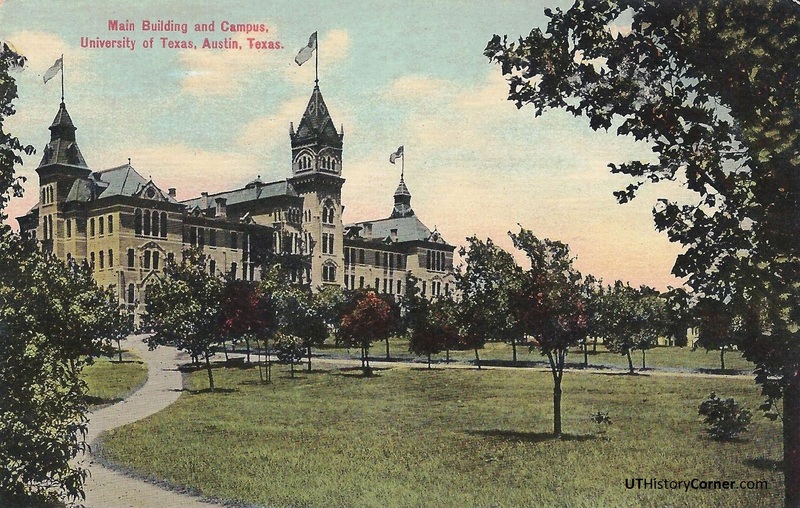 The Education Building, later renamed Sutton Hall, is on the left, and was intended to be the first of four similar structures to form a quadrangle in southwest corner of the Forty Acres. 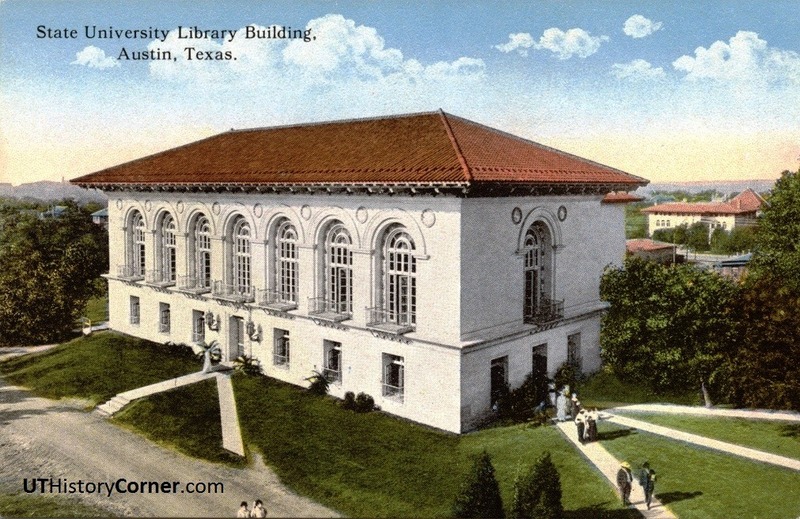 Sutton and Battle Halls were the only two UT buildings designed by architect Cass Gilbert. 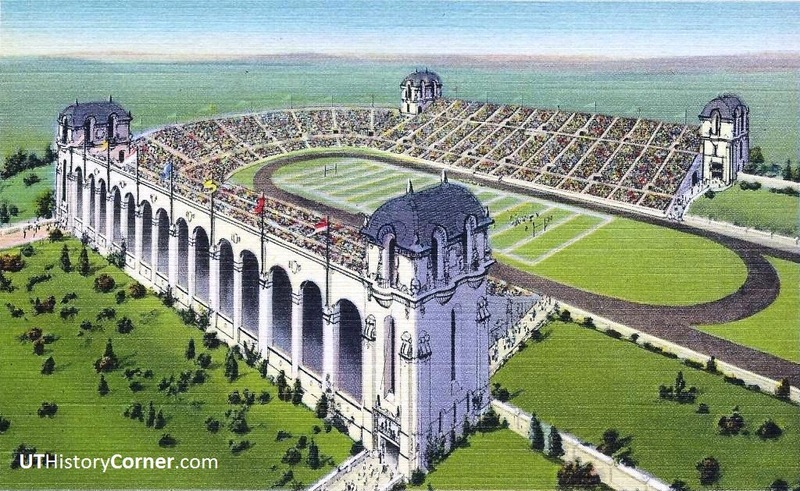 Dallas architect Herbert Greene’s initial design for a new football stadium appeared on postcards across the state and was used to solicit funds for construction. Memorial Stadium was built and dedicated in 1924, though costs never permitted the completion of the ambitious Italianate facade. A late 1920s campus view from University Avenue. 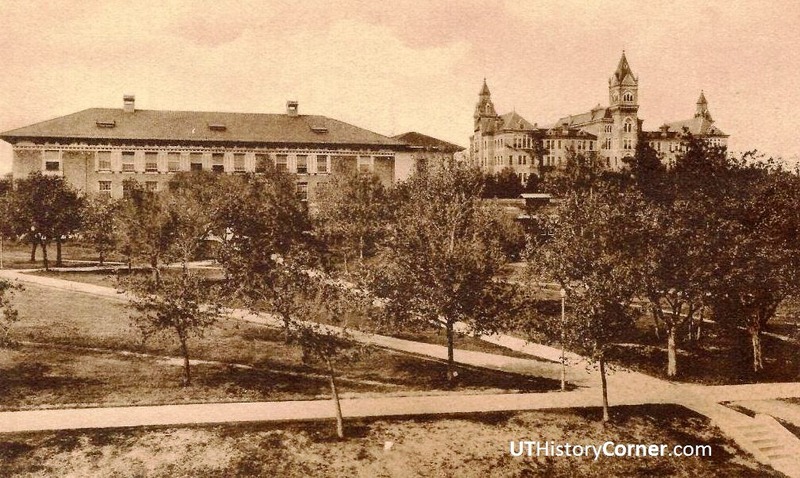 While most of the roofs were made of red-orange tile, Old Main was actually covered in a roof of gray slate.